Osteoarthritis (OA) is a common degenerative condition, reflecting wear and tear of a joint, linked to the ageing process. Trauma (for example sport’s injury), obesity or other causes of joint loading will tend to speed up the development of this painful condition. The initial treatment of OA in the knee consists of physiotherapy and pain relieving drugs such as anti-inflammatory agents, eg non-steroidal anti-inflammatory drugs (NSAID’s) such as brufen, Ibuprofen and Nurofen. 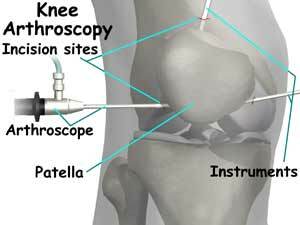 Steroid injections into the joint are also used in the treatment of OA of the knee. Aspiration (draining fluid) of the knee joint to relieve the joint of excess fluid is also conducted under local anaesthetic, however, there may come a time when these treatments prove ineffective. Washout - If the above treatments are ineffective, the Orthopaedic surgeon may advise the patient that a washout of the knee is required. This procedure involves the insertion through an incision (often with general anaesthesia having been given beforehand) of a fibre optic camera into the knee joint. Fluid such as normal saline is then introduced to ‘flush out’ debris. Debridement - Instruments can also be inserted, to cut away any abnormal cartilage or bone. Evidence – What does it do!? More studies are becoming available to see if this is a helpful procedure, but generally speaking the current research results from studies are providing contrary information. There are a number of studies that will be outlined below, to give the reader an idea of the range of outcome measures that have been looked at. At 2 years post procedure, interestingly there was no difference from pain or function between these categories. ** However, another study revealed that 1 year there was significantly better pain relief in the debridement plus washout (80% of the group) than in the washout only group (14%). ** In 90 patients, greater volumes of washout seemed to improve pain at 1 year when using 3 litres as compared to 0.25 litres; however, there was no difference at this time point in terms of joint function or joint stiffness. These are fortunately uncommon; some are the same as are seen in general surgery practice, an example being the incorrect method of inducing anaesthesia. It is surprising that there are only few in this category relating to patient safety. Localised infection, cellulitis and inflammation at the site of entry can be seen. Bleeding into the joint can occur and the orthopaedic team should come to see the joint on a regular basis to ensure that there is no worsening of the symptoms. NB This article does not constitute legal advice and should not be relied on as such. No responsibility for the accuracy and/or correctness of the information and commentary set out in the article, or for any consequences of relying on it, is assumed or accepted by any member of Dutton Gregory LLP.